Eye bags and under eye circles, are they the same, can I have one without the other? These are the questions many of us ask as we look in the mirror and see the worsening of sagging skin under our eyes. I am a physician solely dedicated to the specialty practice of injectable arts with a focus on under eye area conditions; and the creator of EyeRise™, a treatment for this problem. When asked this question by my patients, I simply answer: Yes, it is possible for the conditions to exist independently, but usually, the two conditions exist together and make each other look worse. The good news, one non-surgical treatment using cosmetic fillers can treat both problems by significantly reducing or eliminating under eye darkness. Let’s explore further. WHAT IS THE MOST COMMON CAUSE OF UNDER EYE BAGS? 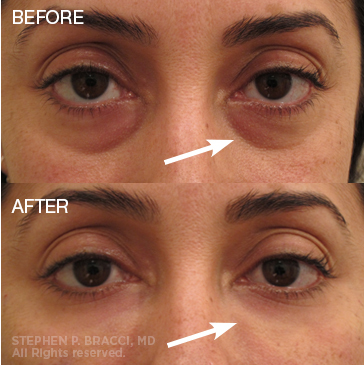 Under eye bags occur when support is lost below the skin in the under-eye and mid-face area. This loss of support causes the skin to fold inward, creases form, and bags appear. The loss of support can be a result of aging or genetics. WHAT IS THE MOST COMMON CAUSE OF DARK UNDER EYE CIRCLES? Creasing below the eye, and how the light reflects off the crease. The deeper the under-eye crease becomes, the more light is reflected off and the darker the skin appears. This cause and effect relationship between under eye creasing and light reflection is the meaning of eye bags and dark under eye circles making each other look worse. WHAT IS THE MOST EFFECTIVE WAY TO SOLVE BOTH PROBLEMS? Preventing further loss of support in the under eye area through non-surgical cosmetic filler treatments like EyeRise™. During the EyeRise™ treatment I use a cannula to inject a tailored combination of injectables into each layer underneath the skin, with the ultimate goal of restoring the skin to its original position, smoothing the creases that cause light to reflect and under eye darkness to appear. After treatment, you will leave the studio with the natural architecture of your midface restored and your natural glow shining through. In conclusion, yes, some people have under eye bags without under eye darkness, or under eye darkness without under eye bags, but most often these two conditions contribute to each other. Whatever the problem, it can be reduced or resolved with the same non-surgical under eye treatment like EyeRise™. Are Genetics The Reason You Have Eye bags in your 20s?